Well I promised you some photos of Easter. Keep in mind these were taken with the iPhone so they aren't wonderful, despite some editing in Photoshop. In the end I didn't get to do as much as I wanted for the brunch. The holiday kind of snuck up on me and we are in the middle of so many home projects right now that I am so easily distracted! Right before Christmas we bought a picnic table at Lowes for $80 and it's one of the best purchases we have made to date for the house. We have plans to paint it the same color as the exterior of the house but for now I cover it with a fancy table cloth and you don't even know you are eating at a picnic table. 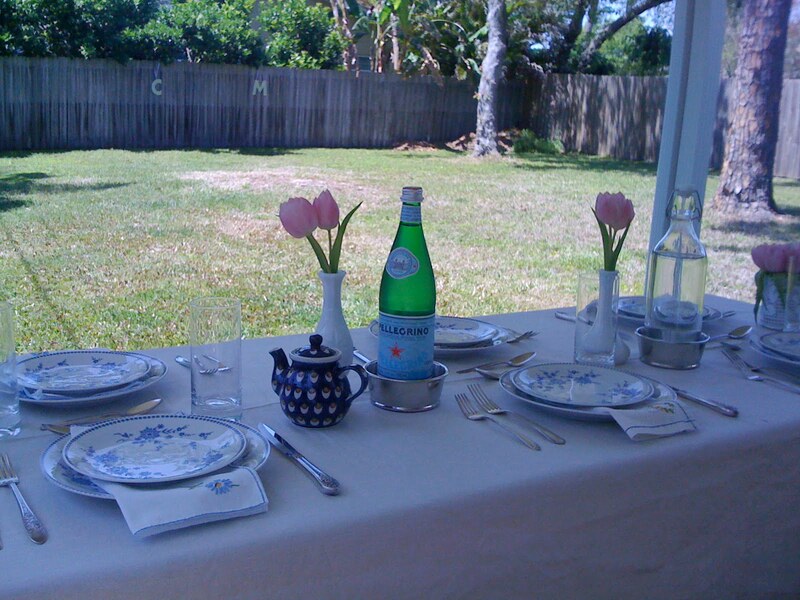 It made a great table for the brunch and it sits six comfortably so it was perfect. I was able to use the vintage linens and silverware from our wedding and the tablecloth is actually a huge piece of gorgeous linen my husband's aunt lugged here in her suitcase all the way from Germany last year. It's some of the heaviest linen I have ever worked with and I love it, I am going to continue to use this piece as a tablecloth but I still have about 10 yards left for other projects. I bought two bunches of tulips from the grocery store and split them up among 4 vases. I made two of the vases out of tin cans and some lace I had (also from the German aunt). I secured the lace onto the cans with double sided tape so you couldn't see it. 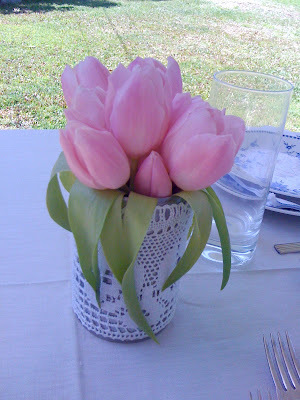 I love the way it looked with the tulips, it had a great vintage feel. 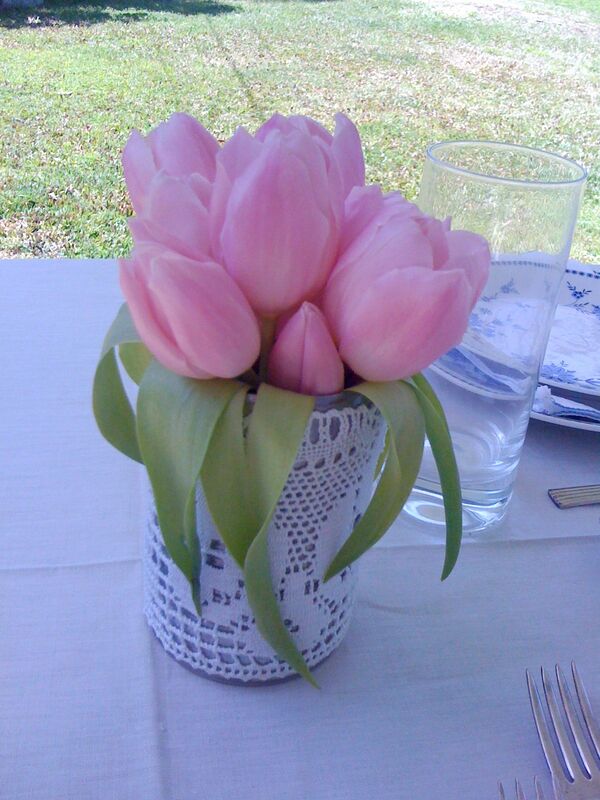 The remaining tulips went into milk glass (also from our wedding). I wasn't able to do much more because of time constraints but overall the brunch was a huge success. I am throwing a dinner party in a couple of weeks and hopefully I will be a little more prepared because I have some great ideas I would love to implement. It just seems like time always escapes me. it turned out great...i love tulips and your color scheme...i love benches they definitely come in handy!